While FDR was sailing the Keys, the larger world was glittering. Chaplin, Gershwin, Hemingway, Fitzgerald, Bessie Smith, Louis Armstrong, Gertrude Stein, Frida Kahlo, Martha Graham—all were flourishing in the Roaring Twenties, but so were Stalin, Al Capone, and Hitler. The world went on as Roosevelt fished for mangrove snapper and drank martinis. 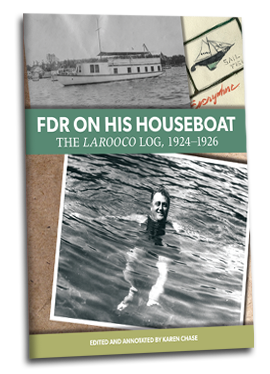 Karen Chase presents FDR’s log entries, interspersed with photographs from the tumultuous outer world, to form a kind of timeline between two arenas—one man’s small private life full of struggle and fun, juxtaposed with the large public sphere. Chase gives us a side of FDR seldom seen before, revealing his wit, his penchant for practical jokes, and his zest for each day’s ordinary concerns in the context of his painful struggle to regain the use of his legs. For many decades FDR’s log has been virtually unknown to the public, appearing only once, in 1949, in his son Elliott’s four-volume collection of Roosevelt’s personal letters. The book also includes a facsimile of the original Larooco log. 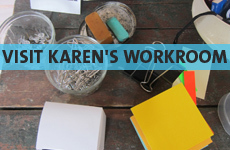 Karen’s memoir is a truly remarkable piece of history. 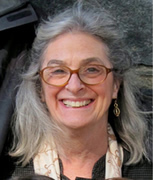 In 1954, Karen Chase was a ten-year-old girl playing Monopoly in the polio ward when the radio blared out the news that Dr. Jonas Salk had developed the polio vaccine. 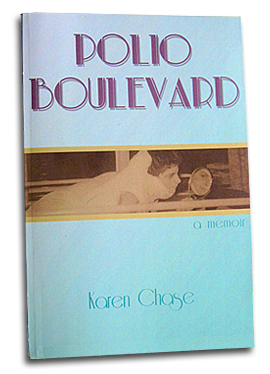 The discovery came too late for her, and Polio Boulevard is Chase’s unique chronicle of her childhood while fighting polio. From her lively sickbed she experiences puppy love, applies to the Barbizon School of Modeling, and dreams of Franklin Delano Roosevelt, a polio patient who became President of the United States. Chase, now an accomplished poet who survived her illness, tells a story that flows backward and forward in time from childhood to adulthood. Her imagination soars in this narrative of illness and recovery, a stunning blend of provocative reflection, humor, and pluck. Enter your email to be the first to learn about upcoming events and other news.